Chandigarh, January 30 : On the occasion of Martyrs’ Day today, His Excellency, Shivraj Patil, Governor of Punjab and Administrator of UT Chandigarh and Lt Gen Shankar Ranjan Ghosh, General Officer Commanding-in-Chief (GOC-in-C), Western Command paid tributes at the Chandigarh War Memorial, Bougainvillea Garden to the valiant soldiers of the country who laid down their lives fighting for the cause of the nation. 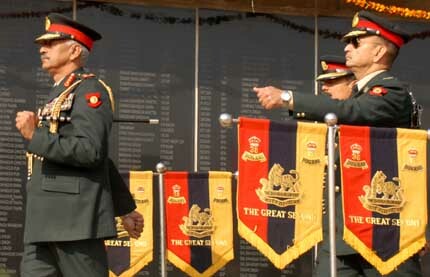 War decorated veteran soldiers, civil dignitaries and Senior Officers from Wstern Command were also present during the occasion .Veteran officers also laid wreath on this occasion. The well coordinated drill by highly spirited, well turned out jawans, embellished the scene, filling one and all with pride and admiration. The memorial service and the wreath laying ceremony were a perfect tribute to the numerous martyrs who made the supreme sacrifice to uphold the sovereignty of the country. 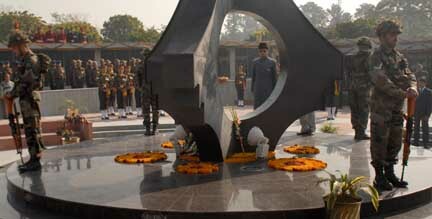 The Wreath laying ceremony was followed by a candle lighting ceremony in the evening at the Chandigarh War Memorial. The Memorial, which lists the names of martyrs from Punjab, Haryana, Himachal Pradesh and Chandigarh is an expression of the nation’s gratitude towards the supreme sacrifice made by the bravest.